The games came thick & fast in April, with the club playing no fewer than 10 matches as we approach the end of the season. Hammersmith won the match 4-3 with 2 matches remaining. Monday 11th April we are home to Ealing B, followed by Thursday 12th May away to Harrow A. We are now favourites to win the League and promotion. Phil is one of our newest members. The other Chris was a guest of Chris Moore’s; he lives in Spain but dropped in for a game whilst over on vacation. Great result for the team last night, an 8-0 whitewash!! Cannot get any better! Our closest rivals DHSS who have played 6 (two games more than us), having won 5 and drawn 1. We meet on the fields of Agincourt on Tuesday 26th April. Let’s get as good a turnout as we had last time and we will have the same success as Henry V!! A splendid win for Hammersmith securing top spot with 1 game to go. It was a tense affair going to the wire. With the scores level at 1.5-1.5, Robin Lee beat off a furious attack and seemed to be heading for a draw. However he managed to Fork his opponents Rook and Queen, winning the exchange and eventually the game. Another tense game that went to the wire. Hammersmith with 2 wins, 3 draws and 1 loss held on to draw the game and win the match 4-3. This will secure promotion to Division 1, however the Championship will probably go down to board count against Richmond. Hearty congratulations to captain Bajrush and his team! On the other side of the hall four new guests arrived, receiving welcome packs and applications forms – welcome to our new members! We hope to see them at our next training evening. Although hopelessly out graded, we put up a good show with 2 draws and 2 losses. We have struggled a bit in this division, but with the influx of new members will certainly do better next season! 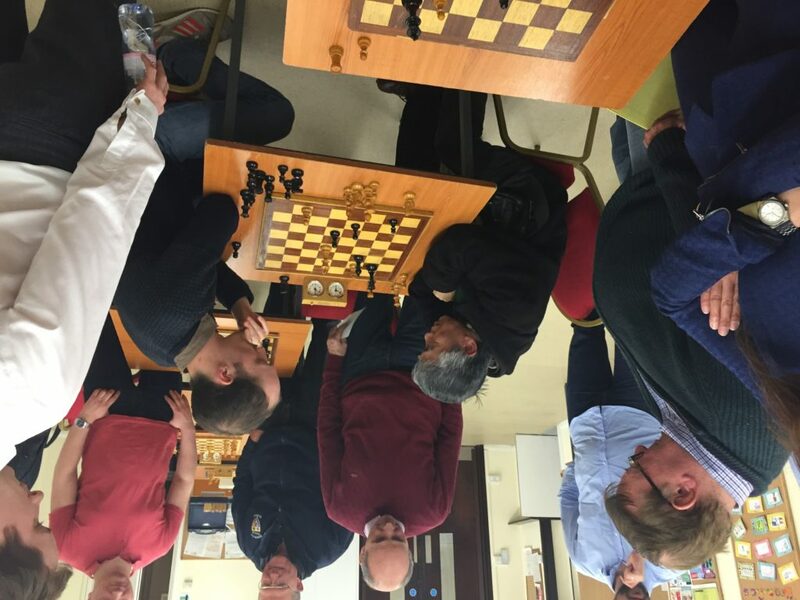 Our London League 4 second team welcomed two of our newest members, Gokhan and Phil. Gokhan fared well on his debut with a win. Robin was again the star, winning in 16 moves! The overall result was a loss for us 3-5. No shame in that though, Newham are top of the league! This last 3-5 loss means we are relegated to Division 3. A great shame for Bajrush and his players – we’ll be back in Division 2 next season. This was Hammersmith’s first clash with a Junior team. A suburb little tournament, turn out, and a very pleasing result. Two matches were played, with a 3-3 result in both – match drawn! You can read a full report of the match here. 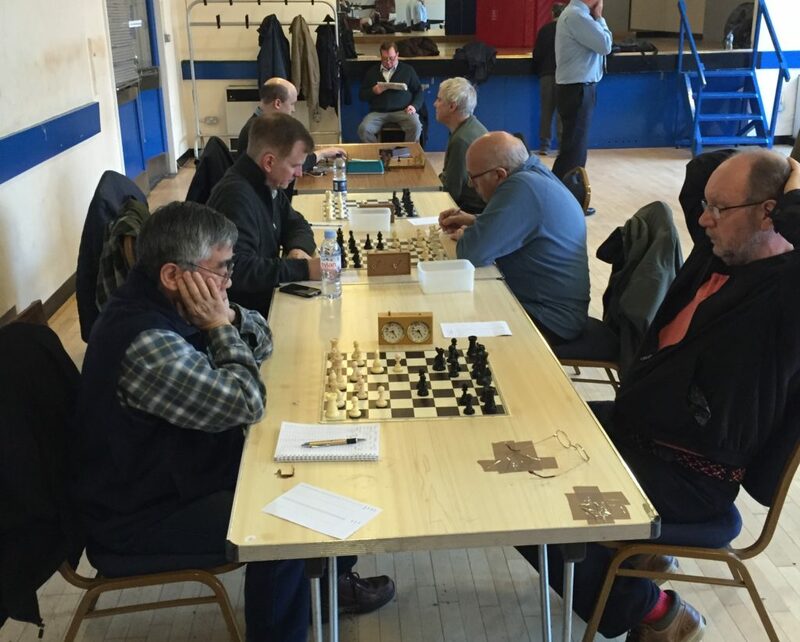 A nice win for Hammersmith, with Dan excelling again on board 4, and John R winning with a nice controlled attack, despite giving away 13 grading points to his opponent. A special Committee meeting took place at the clubhouse from 6.30pm to finalise details of our Club Constitution. Some other business was discussed and will be finalised at our next Committee meeting. A training session started after the meeting in which Bajrush demonstrated Rook-Pawn endings. The endings were well known positions: the Lucena and the Philidor positions (the two articles are well worth a read if you’re unfamiliar with either of them). Another successful turnout and an excellent display from Bajrush. 25.04.16 – The training in full swing. Mike, Bajrush and several other members watch on as Robin takes on a visitor – no pressure Robin! To round the evening off an excellent and original tournament took place, whereby members were split into two “teams” but then rotated around the boards. An excellent way to encourage original and agile thinking about positions. 12 members took part and it was superbly controlled by Bajrush. We will certainly do this again! Our promotion hopes took a setback with this loss to what looks like the strongest team in the league. Hammersmith lost narrowly, 3.5-4.5. We have one game left and should be overwhelming favourites to beat Athenaeum who are floundering near the bottom of the table. This will give us 8.5pts. Newham have completed their season on 8pts. Streatham who have also completed their season have the same score as us but after beating Kings Head 8-0 have a board count of +36 compared to our +30. DHSS have two to play (Kings Head, and Wanstead). Sitting with 7pts they could end up with 9pts. An excellent draw for Hammersmith – on board 1 Robin won in double quick time against a strong 130-rated player, and I had a nice controlled draw against a 123. Full list of fixtures & results can also be found here. Thanks to all members & players, and best of luck in our remaining games this season!